LOS ANGELES -- The dominoes fell almost perfectly for St. Louis in Friday's first round of the Entry Draft. The chain reaction started nearly two weeks earlier, when St. Louis surprised the hockey world by obtaining goalie Jaroslav Halak from the Montreal Canadiens in a bold trade just days after the Stanley Cup Final. In order to obtain quality, however, the Blues had to give up quality, surrendering two of their top forward prospects -- Lars Eller and Ian Schultz -- in the process of adding Halak to the roster. And once the euphoria of obtaining one of the game's elite young goalies passed, Blues management realized that it had stripped the forward cupboard virtually bare in the process. "We needed to fill another part of the kitchen," is how Blues president John Davidson put it. "We needed to fill the forward position." While selecting USHL top scorer Jaden Schwartz -- a player that has been compared to Buffalo's super scorer Thomas Vanek -- at No. 14 started that process, it wasn't nearly enough. St. Louis very much wanted to add Russian forward Vladimir Tarasenko into the fold as well, but feared the highly-skilled winger would not make it out of the first round. "He's a tank," Davidson said of the son of legendary Russian forward, Andrei Tarasenko, who played in the 1994 Olympics. So Vice President of Player Development Doug Armstrong received his marching orders and went looking for a trade partner to get another pick in the first round to get the second forward high on their list. But nobody gives away picks, so an incentive had to be found. An analytical perusal of the Blues depth chart revealed the incentive would have to be gleaned from the blue line where the team believed it had an embarrassment of riches when it came to offensive defensemen. With Erik Johnson already entrenched in the lineup and Alex Pietrangelo, a first-round pick two years ago, knocking on the door, David Rundblad was the pawn put in play. 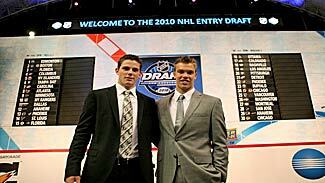 Rundblad, a Swede, was the Blues' first-round pick last year. "It would be hard to fit those three guys in your lineup at the same time," Davidson said. "There's not enough ice, not enough power-play time." Before too long, Ottawa came sniffing around, seeing the opportunity to join Rundblad with its own impressive Swedish prospect, Erik Karlsson. Senators GM Bryan Murray saw a player that was recently signed to his entry-level deal and who had already committed to playing another season in the Swedish Elite League -- under the coaching of a former member of the Ottawa front-office staff, by the way. "He's one of the people that fit today's game," Murray said, praising Rundblad's skating and puck-moving prowess. "I remember seeing (St. Louis VP of Hockey Ops) Al MacInnis at World Juniors, and saying, ‘Boy, you have a heck of a player there.' He said, ‘I know.'" With that, a deal was born. Both sides waited with bated breath as the Kings traded for the No. 15 pick, only to exhale when the hosts claimed American defenseman Derek Forbort, leaving Tarasenko on the board and allowing St. Louis to execute a plan that only came to fruition because of some serious behind-the-scenes machinations. "We knew in losing Lars Eller and Ian Schultz that we needed to find some forwards, and I can't tell you how happy we are," Davidson said. "We had both of these guys targeted in the draft and we were going to be happy with one, and to get two we would be real happy. Now we are excited; very excited by both players."